This afternoon, Toke Moeller and I are hosting a little session on Art of Hosting basics at a gathering for emerging indigenous leaders. We decided this afternoon to bring real design challenges into the room and we improvised this simple, simple design checklist. In some ways this is the simplest form of the chaordic stepping stones. Here’s how it works. In my experience good participatory meetings result from good design and preparation. In this diagram the meeting itself is the last thing we design. 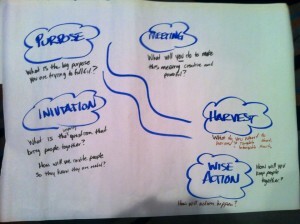 First we design the bookends: Purpose on the one hand and harvest/action on the other hand. Once we know that, then we can develop an invitation and finally choose processes that bridge the two sides. The meeting itself therefore become the vehicle by which a group of people reach a harvest and wise action ground in a purpose and a deep need. What is the big purpose that we are trying to fulfill? A meeting that has too small a purpose has no life in it. It just seems to be a mundane thing done for it’s own sake. To design creatively, keep purpose at the centre and ensure that everything you do is aligned with that. What do you want to harvest? – in our hands ( tangible)? – in our hearts ( intangible)? Not every meeting needs to have a report and an action plan, but every meeting does have a harvest. This question is the strategic conversation that helps us focus our time together. We need to think about the shape of the harvest we can hold in our hands (reports, photos, videos, sculptures…) and those we hold in our hearts (togetherness, team spirit, clarity, passion…). How will we make action happen? – who will help us tune in to the reality of the situation? How will you keep people together? It is easy to make a list of to do’s at the end of a meeting and feel like something has been accomplished, but that is a naive approach to change. If action is required get really clear about who needs to be involved to make it happen. Think about who enables action or who can stop it and what resources are required. And if the resources aren’t available or accessible, then make a different action plan. Also, never forget to make a plan for how people will stay together. If sustainability is important, then strong relationships are important. Building a process that doesn’t enhance relationships does not contribute to sustainability. What is the inspiring question that will bring people together? How will we invite people so they know they are needed? Good participatory gatherings depend on the quality of the invitation. A lazy invitation attracts confused participants. A clear and powerful invitation accompanied by a powerful personal invitation gets participants who are ready and eager for the work. Invitation is a lot of work. It SHOULD be a lot of work. A good invitation process makes the meeting easy. What will you do to make the meeting creative and powerful? Once we know all of this we can choose a meeting process that helps move from purpose to wise action. We can use pre-existing processes like Open Space or World Cafe or design new ones particular to our needs. Today we are using the group pattern language card deck to inspire creative thinking about meeting design. If we really want to create a new normal, we shouldn’t settle any longer for boring meetings. If the processes we are using aren’t serving us, or helping us crack the deepest questions that confound us, then we should stop using them and start being more creative and powerful. This little tool has the feeling of a portable, quick and dirty design checklist, that allows core teams and process designers to get working pretty quickly. Use it and let me know what you learn. Hi Chris: I like it. It addresses and expands upon the basics contained within the IAP2 and. AccountAbility models, at the most important emotive level, however it fails to baseline and spport communication and engagement styles and preferences of those to be engaged. The approach you propose rightly focuses on outcomes and outputs, and the all-important follow-up participation phase, however processes mis-aligned with organizational culture amd individual feelings of power disparities and knowledge / understanding / perceptions have skuttled more than well-intended intervention. Think there is an important missing fifth dimension. Well the question about how action happens actually goes into that. When I taught this yesterday I talked a lot about getting real about the way in which stuff works in the organization. That includes understanding culture and power. At any rate this is a “back if the envelope model” and as such is barely two dimensional let alone five. I’m growing a little weary of five dimensional models where two dimensions will do and vice versa. I find it helpful to distinguish between two quite different kinds of conversations: conversations for insight and conversations for action. And I think it best to keep them apart. Conversations for action occur when we know what to do a and just need to get it done. These conversations, like Carse’s finite games, are conducted to completion and from them we harvest commitment and accountability. @Geoffry – don’t forget conversations for relationships. I’ve just finished reading Peter Block’s Community and this has really been hit home for me. Very important book. Relationships are harvests too. Plan accordingly. Peeked back at this to prep for a meeting tomorrow. Great questions here that aren’t necessarily in the Chaordic Stepping Stones / 8 Breaths; really appreciating the simplicity and effectiveness. They are now folded into my hobbit tools! Enjoy Mordor! It’s lovely this time of year!